My Friday night shorts series continued with Ladies of the Land. Like Rare Chicken Rescue, the movie clocked in at around 30 minutes and, this time, four women involved in farming are profiled. Ladies of the Land alternates between showing the women plying their trades and discussing what attracts them to agricultural work alongside commentary from a couple academics who study and support women farmers. 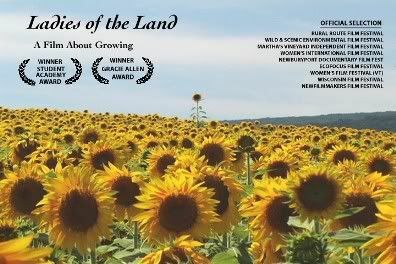 Early on in the movie, we are treated to some nice shots of the countryside and learn that, even 20 years ago, women were not generally recognized as farmers. However, more women are going into farming today. Suzy Chavie, for instance, decided that she'd had enough of the corporate world and also wanted to raise her child in the country. And so she moved out of the city and started an organic farm. This kind of story rings true with two of the other women featured. The odd woman out, Kim Tait, was already farming with her husband when he suffered an untimely demise. But she opted to keep the farm going and did so with the help of Rebecca Claypool who help to introduce the movie to the audience. Most of the women did not come from a farming background yet found something about the life appealing. Lyn Garling just had an inexplicable attraction to raising cattle and so she started the Over the Moon Farm. 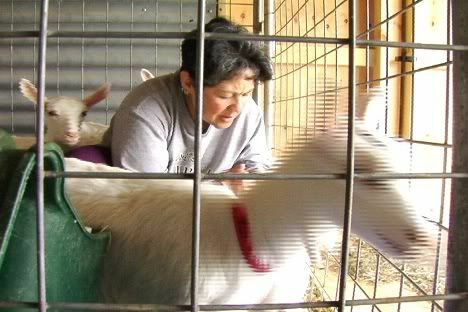 Elly Hushour heard about the salutary effects of goat's milk and decided to start raising goats. Throughout the movie the women describe the almost ineffable pleasures of raising animals and tending the land. The experts, on the other hand, offer some different theories. One noted that women are less willing to go into conventional farming as it is very capital intensive. Instead, women tend to run smaller farms which give back to the community and act as de facto community centers. In addition, we are told that women like meeting their customers and value their relationships with the land and their neighbors. The implication here is that men like none of these things and prefer conventional farming because, well, it's more "manly", apparently. Had a male professor or a male farmer tried to draw such distinctions between women and men who farm, I can't help but think that such touch feely theories would have been rejected. There were no real disappointment but I did come away with a wish list. It's too bad that it didn't discuss more just who the women are that are going into farming. I'd like to know whether a significant number of the women are like Ms. Chavie who abandoned city life for something more bucolic or whether they are more like Ms. Tait who had a farming background and became the primary operator. Are young women taking over family farms? I also wish that the movie actually showed more farming. I once asked a co-worker who fought in the Vietnam War if any Hollywood movie gets close to his experiences. He said that some did but the one thing that they can never get is the smell – the smell of the jungle. I suppose that trying to make a movie about farming is similar in that you can never really get across everything. But while shots of Ms. Chavie in her kitchen preparing to put up vegetables while her son frolics in the yard are nice, they do very little to actually convey the incredibly hard work of farming. Despite a Lifetime Network vibe, Ladies of the Land is an interesting and concise look at an emerging trend in our society.